Karrli's memorial service was attended by approximately 300 people, who filled the main meeting room of the Main Line Unitarian Church in Devon, Pennsylvania on August 20, 2004. 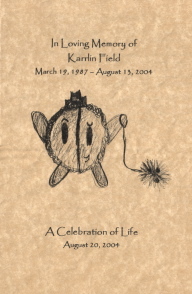 The cover of the program featured Karrli's cartoon characters "Mr. Fuzzy & FluffMutt." The printed program lists the music that was played that day, music chosen by her family based on Karrli's favorite CDs that were in the CD player in her car, and based on specific songs she had talked about with her family. The seven songs played that day don't even begin to capture the range of her musical interests, but they were a good selection for the occasion. For example, she loved the singer Daniel Bedingfield, but we weren't able to find a specific song of his that she had mentioned. Sting ‚ "Brand New Day"
Evanescence ‚ "My Last Breath"
Bare Naked Ladies ‚ "Pinch Me"
Elton John's "Rocketman" in a hilarious rendition as performed by Stewie Griffin, the demented world-conquering infant from the "Family Guy" animated series. Blessid Union of Souls ‚ "Hey Leonardo (She Likes Me For Me)"
Jimmy Eat World ‚ "The Middle"
Earth, Wind & Fire ‚ "Let's Groove Tonight"
The program reproduced the lyrics of two songs in particular that had a positive message about people being loved for who they are, and having the courage to be who they are: "She Likes Me For Me", and "The Middle." The printed program included information on where to find Karrli's writings online including the reviews of the "Teen Titans" animated series that she published on the "TVTome" web site, and listed the speakers including friends, family, and caregivers. The speeches were funny, beautiful, and inspiring. By focusing on Karrli herself, her own words and her own work, her personality was truly brought to life. As many of those in attendance observed, the memorial service captured the many aspects of Karrli's achievements and personality, and made everyone there feel as though they knew Karrli well. They captured her as a friend, as a sister, as a gifted writer, as an aspiring video game author, an animal lover, as a summer employee, and as someone with cystic fibrosis, who had inspiring courage and an unforgettable sense of humor. The speeches included many quotes from Karrli, a few excerpts from her writings, funny stories, and even excerpts from the resume she submitted for a summer job. The service lasted about 90 minutes. The weather was warm, sunny, and beautiful. Photos of Karrli were on display, many of the same photos on this web site. Following the service there was a reception. We have included here a copy of the program, a scan of the program including the cartoon characters, and copies of the speeches given that day by Karrli's family. If you wish to proceed through all of the materials, simply click "Next Page" at the bottom of each page. Or, you can review individual sections as listed below. The floor will be opened for guests to share brief words or anecdotes in remembrance and celebration of Karrli's life. Lyrics to "Hey Leonardo (She Likes Me for Me)"